People see Bruce Lee as a great martial artist. He certainly was; however, he was much more than that. He influenced (and continues to influence) many people, including many famous personalities. This is a story of Bruce Lee’s influence over a person who was not famous; an unknown individual to whom he reached out to, and through the “Be Water, My Friend” philosophy, radically helped to change this individuals life, forever. Many people quote the “Be Water” phrase, and up until recent years, few had truly studied it and applied it to their lives. Thankfully more and more people across the world are beginning to understand the depth of Bruce Lee’s words, and practice the daily application of them. This is a story of at least one person who studied, understood, and applied the principles to his life. The “Be Water, My Friend” philosophical tenet encourages a person to empty the mind, but this does not mean to remove the thinking process, rather to clear it from distracting negative thoughts in order to reach a heightened awareness in light of the fact that life is a revolving and evolutionary process. It must not be cluttered, nor passive, and like a flowing river which is not stagnant. People should discover their true selves, not attempt to be someone else, and realize that peace of mind comes from within. Water already has all the necessary elements in it, and it needs to continue to flow to have synergy with its surroundings. The human body contains 90% water. To “be water” means to go with the flow, be oneself, adjust to many challenges, rather than to fight them as they come. Through his teaching, Bruce encouraged people not to “pray for an easy life, but to pray for the strength to endure a difficult one”. Bruce applied these principles to his own life, and modeled them for others to benefit from, since life can be lonely and tough at times. In the mid 1960’s, there was an Army private stationed at Fort Lewis, Washington in the United States. A black belt teaching hand-to-hand combat to military police and a few other highly screened people. This individual, through research, discovered James Y. Lee (no relation to Bruce) who lived in Oakland, California. James was writing and teaching Iron Hand Training – the art of board and brick breaking. 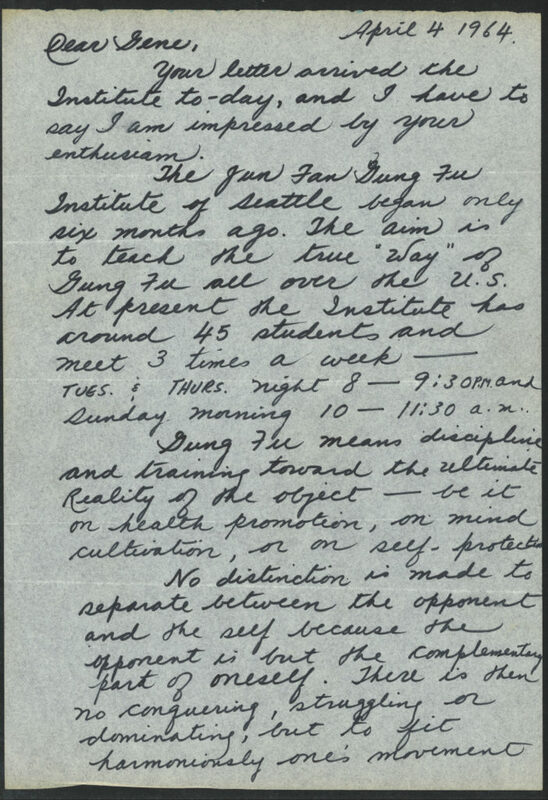 At the time, Bruce Lee’s first school, the Jun Fan Gung-Fu Institute of Seattle had been open for only a short period of time. After learning about Bruce through James Lee’s teachings, the private wrote Bruce a letter. To the private’s surprise, Bruce responded. Bruce replied with a 3 page letter stating that he was impressed with the private’s “enthusiasm” and encouraged him to continue his martial journey. The letter, a copy of which happens to be displayed at the “Do You Know Bruce” exhibit at the Wing Luke Museum in Seattle, Washington, was filled with valuable philosophy and practical teaching of Jun Fan Gung Fu. Although the private was thrilled with Bruce’s offer to “look him up” whilst Bruce was holding a demonstration in California, the private, and the entire battalion of MPs, were sent to Vietnam. The private continued to write to Bruce and James, and adopted the philosophies Bruce had written about in the letter, to all aspects of his life from then on. Unfortunately, James and Bruce would pass away before the three of them were able to meet in person. Page 1 of the letter Gene Snelling received from Bruce Lee in 1964. In his school days, the private was at the bottom of his high school class, and almost did not graduate. He was very confused, and was a trouble making teenager, heading for either prison, or worse. He felt connected spiritually, but continued to have struggles and challenges. Despite those challenges, he was accepted to college, worked a full time job in the afternoon, and studied hard every night. Five years later, he graduated with 2 degrees, with Honors, and walked across the stage to accept his degrees, with no college debt. He spent 20 years in the Army and went from Private to Sergeant Major (the highest rank possible for a Non-Commissioned Officer). While in the Army he studied for, and received, his Masters Degree, and PhD in Counseling Psychology in his limited down time. Honoring his hard work and progress, the private was awarded with a Direct Commission as a First Lieutenant in the Medical Service Corps. Even though suffering from his Vietnam and military experience, and being awarded 100% disabled status, he did not quit. After discharge from the Army, the now Sergeant Major, founded and was president of a counseling and training center in Florida for 20 years. As a part of the Royal Palm Counseling Center, he worked in Prisons for 11 years, giving hope and encouragement to people whom society had seemingly forgotten. He is now in Georgia, engaging and encouraging members of his community to never give up, and to “be water”. He is now 80 years old, but continues to follow the encouragement he received from Bruce Lee, to “Be Water, My Friend”. I know this story is true, because … I was that private. May the legacy of Bruce Lee continue to live on. Gene Snelling kindly donated a copy of his original letter from Bruce Lee to the “Do You Know Bruce” exhibit at The Wing Luke Museum in Seattle, WA. The exhibit is open until 2019. He is also a proud supporter of the Bruce Lee Foundation’s Little Dragons program.